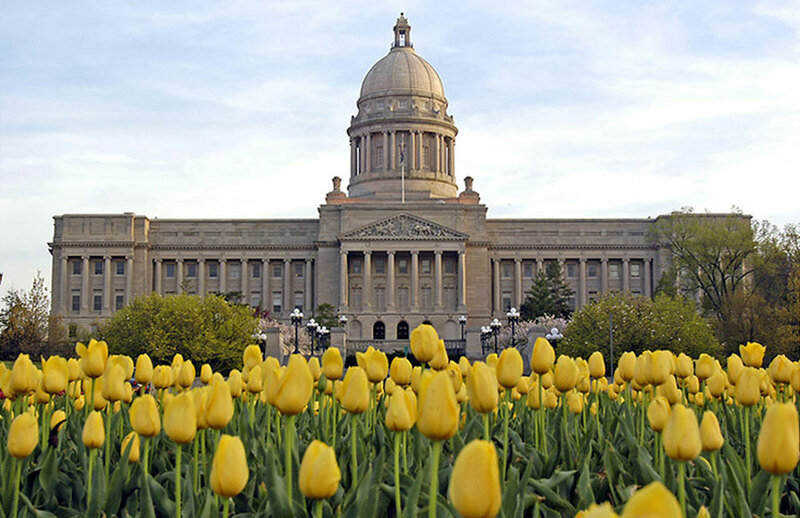 Without a doubt, our class trip to the state capitol in Frankfort on Tuesday was a valuable experience. Not only did my class have the opportunity to explore an important location in our state history, we were able to witness a revolutionary proclamation that continues to have immense worth in our society. First, our group had the opportunity to meet with Eleanor Jordan of the Kentucky Commission on Women. Ms. Jordan shared with us the Kentucky Women Remembered exhibit of notable Kentucky women that hang in the halls of the capitol building. Jordan was quick to address the fact that visitors to the capitol can see the beautiful dolls of the First Ladies upon entering their wing of the building, yet women have made much more valuable contributions within our state than have been previously recognized. Although the portraits are a small token of appreciation to glorify these women’s hard work, the gallery is a unique and crucial development in this male dominated space. Her future plans include the erection of a female sculpture in the building to further illuminate the work of women in our state. Following our meeting with Eleanor Jordan, our group attended the Fair Housing Proclamation in the capitol rotunda. The speakers included John Johnson of the Kentucky Commission on Human Rights and numerous others who support has brought this legislation to the forefront and given rights to many deserving individuals. The most moving part of the proclamation, for me, was Colmon Eldridge‘s speech at the program’s conclusion. Eldridge, representing the office of the governor, came to announce the proclamation but shared a very moving story about his motivation to work for continued legislation such as this. He shared stories about his grandma and his personal home ownership story and why this proclamation has such a personal meaning to him for an African American male. He also noted that the audience was a blend of all shades of color thus emphasizing the fact that this isn’t just an issue of African American civil rights, but rather, an issue every citizen of Kentucky and the nation at large should take note of. Our trip ended following the proclamation and we shared a wonderful lunch at the Grey Goose in historic Midway, Kentucky. Though it was a relaxed atmosphere, it was extremely important for us to bond together and reflect on our experiences of the day as we had just seen real legislation that has come from the time period in which we are continuously studying. As we continue to research each of our respective accomplished women, we must go forth with an understanding that their with civil rights is far from complete and we too much be agents of change in our communities to continue their legacies. I think the way that you addressed the importance of the legislation and your own personal learning experience was amazing. I really like how you focus on how this experience has been able to further your own understanding of the issues addressed at the capitol as well as helping to improve the projects being worked on. I love that you mentioned the part in Colmon Eldridge’s speech about the varying shades of skin color in the audience. It shows that the mixing of different races makes it more difficult to distinguish or identify people by their skin color, but also allows us to appreciate our differenced while embracing that of other’s. I agree! It was a very inspiring day and it is a privilege that we were able to take part in it. I hope they are able to add more artwork featuring Kentucky women to the capitol in the future.